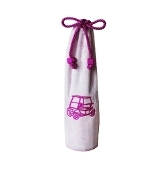 Pretty pink, soft, plush wine or liquor bottle sleeve is perfect for slipping a gift bottle of wine or liquor into before giving to the golf enthusiast. Decorative fuchsia golf cart on front with fuchsia drawstring. Made in the USA. Bottle not included.